AS IT STANDS: Roy 'Fruit Salad' Moore Abused Teen Girls - So What? The Alabama GOP Still Loves Him! Roy 'Fruit Salad' Moore Abused Teen Girls - So What? The Alabama GOP Still Loves Him! There was a reason Roy Moore's professor in college called him "Fruit Salad." Hint; it wasn't because he was gay either. And now we find out the Alabama Republican Senate candidate also likes young girls. Real young. Like 14 years-old. His mentor, Trump, made a brief comment about the allegations saying if they're true he should step down. That's all we going to get from Donnie until Moore's drama plays itself out. I know one thing for sure, the GOP doesn't want to see the heavily favored Moore drop out of the race. It would mean the Democratic challenger might have a chance to win. Losing even one seat in the senate right now could be disastrous for the Republicans. Their majority would be whittled down to one vote, instead of the current two, if Moore wins and holds the seat. Meanwhile the GOP party in Alabama is sticking with their chosen pervert, who by the way is also the founder and president of the Foundation for Moral Law! If you ask me, Moore will fit in nicely with the constantly growing swamp in the White House if he does get elected and the senators let him in. He certainly won't feel out of place. Unfortunately you get what you work for and vote for. 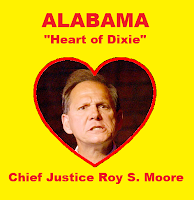 Alabama only wants Republicans, and evolution being what it is, they will eventually devolve into the worst candidates possible .... a fruit salad Roy Moore.